even as I write this entry now (around 10 in the morning of April 16, the ground in Kumamoto and most of Kyushu is still shaking . . .
An entry with prayers for the earthquake victims in Kumamoto. 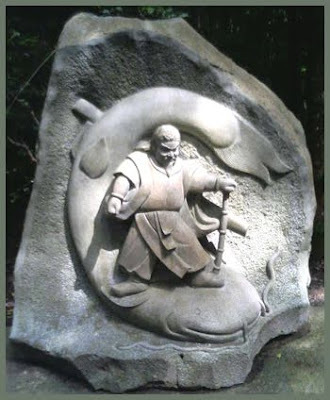 Tekemikazuchi standing on a catfish- on the famous "key stone" "kaname ishi 要石". A giant catfish (namazu　鯰) lived in mud beneath the earth. The catfish liked to play pranks and could only be restrained by 鹿島 Kashima, a deity who protected the Japanese people from earthquakes. So long as Kashima kept a mighty rock with magical powers over the catfish, the earth was still. But when he relaxed his guard, the catfish thrashed about, causing earthquakes.
. Earthquakes and Kigo for Haiku . - - - - - Many earthquakes come with a Tsunami.
. tsunami 津波 伝説　Tsunami legends . -- The following is a collection of sayings and legends about earthquakes, many involve animals, for example the kiji 雉 pheasant calling or a shika 鹿 deer calling. The most common is the giant catfish (namazu　鯰), but other fish are also mentioned, like the eel or goldfish. -- Some other tales are related to - - . The Koshin Belief 庚申講 . a sutra mound （kyoozuka　京塚 Kyozuka) to make the earthquake stop soon. In the year 1596 from September 1 to 5, there were various earthquakes in Japan. During the Iyo Earthquake in Shikoku, it is said that black hair of more that 1 meter length rained all over Japan. and in 1498 (Meiō 7), 1854 (Ansei 1), 1944 (Shōwa 19) and 1946 (Shōwa 21). In July of the year 1780 there was a strong quake of about M 7.4 in the Shonai region. One month later people saw smoke and a "divine fire" 神火 coming out of 御嶽南の峰 the South peak of Mount Ontake. The smoke like black clouds could be seen from far away. In July of the year 1830 there was a large earthquake in Kyoto, with more than 260 dead. People who had gotten a special amulet from the 吉田家 Yoshida family were not wounded by the quake. In the 幡豆郡 Hazu district, if fine weather carries on for a long time, there will be an earthquake. In 角館町 Kakunodate, if an earthquake occurs, the sky will become all red. In the 山武郡 Sanbu district, during the Koshin rituals if people hang a scroll to celebrate, it might bring an earthquake or bad luck. So they finish the rituals fast, drink their sake and put the scolls away as soon as they can. Then they find time to have a feast in peace. Osu-iwa 雄岩 and Mesu-iwa 雌岩, the male (husband) and female (wife) boulder. Along the river 坂ノ下川 Sakanoshitagawa on top of the mountain there was the Osu-iwa. About 300 years ago at an earthquake, it fell down into the valley. Since then every night there is the sound of オーイ、オーイ」 Ooooi, Ooooi, when the boulder is calling for its mate. To appease it an elder of the village hit an arrow into the Osu-iwa and had the Buddha prayer 南無妙法蓮華経 Namu Myoho Rengekyo inscribed into the stone. Now the stone kept quiet. But it is said that it 1000 nuns will have passed the Mesu-iwa, it will also fall down. This has not yet happened though. In the 大飯郡朝嶽 Oi district at Mount Asadake, the deity 御浅明神 Osen Myojin is venerated and its messenger is a "human fish" 人魚, Mermaid. Once a hunter found a strange being, shining sparkling red and the lower part of the body like a fish. He killed it imedially. After 17 days the sea begun to become wild and after 30 days there was an earthquale, which wiped out the whole village of the hunter. In the 安達郡 Adachi district, people chant manze eroku マンゼエロク マンゼエロク and ?? split a flycatcher (ヒタキ) over sleeping children to avoid the worst, especially a fire. In the 南会津郡 Minami Aizu district at 檜枝岐村 Hinoemata village there are some sayings about the weather. If there is thunder and earthquake at night, or if the soot at the bottom of the kitchen hearth starts burning whith a flickering flame, getting on and off, then a rain will come, in the form of a kitsune no yome-iri きつねの嫁入り spell of sunshine during a rain. In the 吉城郡 Yoshiki district, the deity カシワの神 Kashiwa no Kami, the Deity of Oak Trees, is venerated everywhere. He is said to use a walking stick and eat rice. He can also suppress an earthquake.
. kashiwa 柏 Kashiwa-oak . In the 勢多郡 Seta district, if someone is just in the process of making straw sandals when an earthquake happens, the sandals can not be used any more. So people have to be carefull when making these sandals. During a large earthquake on the 15th day of the 5th lunar month in an unlucky year 壬寅の年, a huge mountain was split into two. From its two sides a 異獣 huge monster animal with eight legs came out and flew away with the wind. The local Ezo people tried to catch it, but it was gone in no time. Manjiroku Manjiroku me o samase マンジロク、マンジロク 目を覚ませ Manjiroku, wake up! Manjiroku is a very strong giant, and when he goes to sleep, an earthquake may occur because the big catfish is moving wildly. 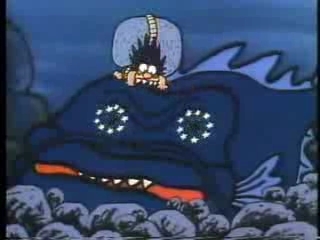 Manjiroku is so strong he can press down the giant catfish or jump at it and bite in its head. Related the events in 鹿島 Kashima and the Kaname Stone. In the 和賀郡 Waga district, people chant マジャラクマジャラク Majaraku Majaraku to appease the Earthquake Deity. In the 大島郡 Oshima district if an earthquake happens along the river 井之川 Inokawa, people lick their palm and chant kyuunuchika キューヌチカ（経ノ塚） Kyozuka in the local dialect) to make it stop. - See also the tales of a Kyozuka in Okinawa. In the 幡多郡 Hata district, if a pheasant calls out very loud, there will be an earthquake. In April of the year 887 there was a strong earthquake, the 仁和地震 Ninna jishin. From the Tatchimon gate of the 平安京大内裏 Imperial Inner Court there was a cloud like smoke rising up to heaven, even sparkling like a rainbow. But in fact it was a huge group of flying ants 羽蟻. In July of the year 1830 there was a big earthquake. People saw a huge bright fireshine (光り物) wandering over the sky, from 丑寅 North-East toward 辰巳 South-East. And one month before that, from the North-East direction, people heard the sound of 石筒 Iwatsutsu. Iwatsutsu no Mikoto is a deity that appears in Japanese mythology. (4) - hyootanike 瓢箪池 the Hyotan-ike "gourd pond".
. Tooji, Tō-ji 東寺 Toji, To-Ji . In the 天田郡 Amada district, for the rituals of Dondoyaki, people place split bamboo in the form of a bow at the entrance of the home and pray it will prevent the home from destruction during an earthquake.
. Dondoyaki どんど焼き Dondo Fire Ritual - New Year . In 鳥羽市 Toba town, if a pheasant calls out loud, there will be an earthquake. If there is an earthquake between 12 and 2, this is a forebode of illness. If there is an earthquake between 8 and 10 or 4 and 6, this is a forebode of strong rian. If there is an earthquake between 10 and 12, this is a forebode of drought. If there is an earthquake between 6 and 8 or 2 and 4, this is a forebode of a storm. - There are more sayings of this kind along the coast of Miyagi. If there is something unusual about the New Year decoration in the kitchen, the coming year will bring bad luck. But if someone happens to be in the kitchen during an earthquake, this will be good luck. If the crows call in an unusual voice, there will be disaster, illness or an earthquake. There are some 鹿島神社 Kashima Jinja Shrines to appease the Earthquake Deity. In olden times seven boulders came flying here from 常陸の鹿島 the Kashima Shrine in Hitachi. They are venerated as the Kaname stones to suppress an earthquake. In 飯田市 Iida if a deer calls at midnight, there will be an earthquake or a fire. At 雲仙市 Unzen town, the farmers were suffering from two 大蛇 big serpents. In 月ヶ瀬村 Tsukigase village, there lived two Tengu, one at Mount 尾山 Oyama and the other at Mount 嵩山 Suzan. Once the two had nothing better to do and begun to carve a whale (kujira 鯨) in the rocks. Then a big earthquake happened and the 鯨石 Kujira Stone fell down in the valley. Now this stone is sunk at the bottom of a dam. In the 吉野郡 Yoshino district, 役行者 En no Gyoja practised austerities till his death in a stone cave. When his disciples and some businessmen went there to take a look at his dead body, an earthquake happened, a storm occured and it rained yellow sand (砂). In 上越市 Joetsu in 1751, during the Nadachi kuzure 名立崩れ landslide of Nadachi, a hunter saw a red pole of fire in the far sky. When he ran home to check, it was all safe. But in that night, the home was destroyed by an earthquake. In 十日町市 Tokamachi during the great earthquake in 1833, at the temple 大照院（大正院）Daisho-In the statue of 不動様 Fudo Myo-O tumbled down and rolled outside. When the people, who had taken shelter in the temple, ran after the statue and outside too, the building collapsed and all were saved by Fudo. a waterfall pool called jishin no takitsubo 地震の滝壷. There live two large crabs, husband and wife. They always fight with a couple of giant serpents from the lake 信濃野尻湖 Nojiri in Shino. In 魚沼市 Uonuma, where a huge boulder, 船石 Funaishi appeared after an earthquake in 1825 destroyed the mountain 船山 Funayama. This boulder has become the place of rituals by the local shamans 神子の口寄せ. If there is an earthquake at 4 in the morning or 4 in the evening, it will be raining. If there is an earthquake at 2 in the morning or 2 in the evening, there will be a strong storm. In the 首里 Shuri district of 那覇 Naha, people call out Kyozuka 京塚 three times during an earthquake. There is a real Kyozuka sutra mound in Shuri and earthquakes never happen there, so just to call its name is helpful. This mound was erected by Saint Nisshu 日秀上人 in 1522, to appease a Yokai monster that haunted the roads of Shuri and 浦添 Urasoe. He wrote the diamond spell of 金剛経文 on small pebbles and placed them there, preparing a mound with a larger stone, inscription 金剛嶺 Mount Diamond. In the 国頭郡 Kunigami district, if there is an earthquake people chant チカチカ chikachika or トーチカ、トーチカ toochika toochika to avoid disaster. In the 三島郡 Mishima district people think an earthquake is caused by a huge 金魚goldfish in the ground. Osaka is often hit by the tail of this goldfish. 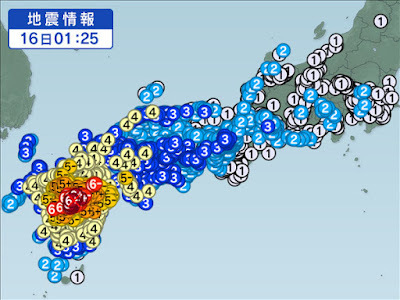 And Tokyo is hit by its head, with an earthquake following. At the 越生町古池 old pond in Ogose there lives a big eel. If he gets wild, there will be an earthquake. To appease him villagers put up a 要石 Kaname Stone for the deity 鹿島様 Kashima Sama and pray for help. In 天城湯ヶ島町 Amagi Yugashima, there is a big fish who sometimes moves and thus causes earthquakes. If during the New Year rituals for 庚申様　Koshin Sama at a private home an earthquake happens, the rituals must be stopped and started again on another day. During an earthquake, Koshin sama will run out of the house and thus there is no point in making offerings to him.
. The Koshin Belief 庚申講 .
. konaki jijii 児啼爺 "grandfather who cries like a baby" . It was also called the Kinpozan earthquake (or Kinbozan earthquake, since its epicenter was the southern-eastern foot of Mount Kinpu 金峰山) and its magnitude was 6.3.
. Natural Disasters 自然災害 shizen saigai - Naturkatastrophe . A bit essentialist take on Japan's ‪‎disaster‬ ‪‎culture‬ and the stoic spirit with which people have come to endure the frequent disasters. This is a huge error of judgment."